Are you looking to promote your brokering services to small business owners or referral sources? 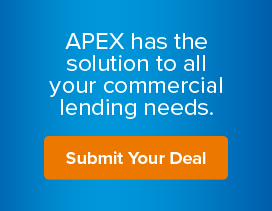 APEX offers FREE marketing support for those interested in advertising for small commercial mortgages. Once you’ve filled out the form below with your contact information and the materials you’d like to receive, an APEX marketing specialist will create and email you PDF files of the materials you’ve requested. Select the Marketing Materials You'd Like. Hold control or command key to select more than one option. Requests will be completed in the order of submission and may take up to 3 business days to complete. If the wait is longer, you will be contacted and notified.